The Eclipse P400S allows users to create a clean and beautiful system with ease while offering extensive flexibility. 10-Colour ambient RGB illumination allows you to customise your system theme, and compatibility with the Phanteks RGB LED strips means you carry this over to the inside of your system too. The P400S adds premium features with a built in 3-Speed fan controller and a sound dampening layer inside the panels. The stunning outer shell of the Eclipse series is constructed using shaped metal for an incredibly high quality finish and look. 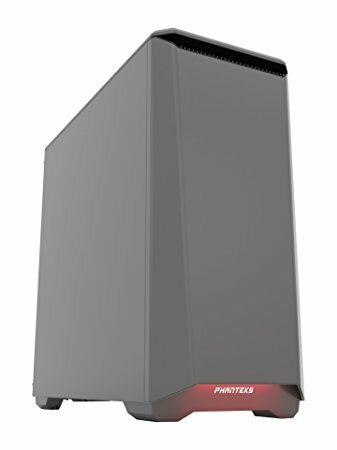 The Phanteks Eclipse P400S Computer Case was added to the Computer Case category in June 2017. The lowest price GetPrice has found for the Phanteks Eclipse P400S Computer Case in Australia is $109.00 from PCcasegear. Other merchants who stock it are PCcasegear, mwave, Amazon AU.